Here are some easy and delicious fresh plum recipes. 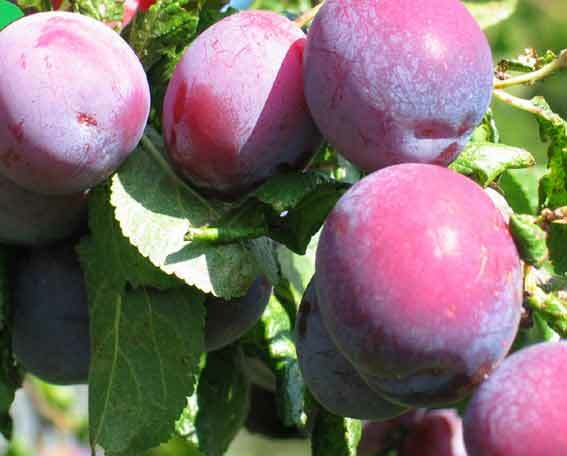 Plums are such an asset for making plum pie, plum pudding or for making lovely conserves. Ripe plums are also good in fruit salads and even in ordinary salad, in small quantities. These plum recipes will help you preserve and use your crop, whether you are taking advantage of a home glut of fruit from your organic plum trees, or you are buying seasonal fruit in the market. Fresh plum recipes for plum jam, microwave plum jam, plum duff for the microwave, apple and plum pudding, plum wine and a selection of useful reading on fresh plum recipes and other fruit recipes. You only need plums and sugar for this easy fresh plum recipe. 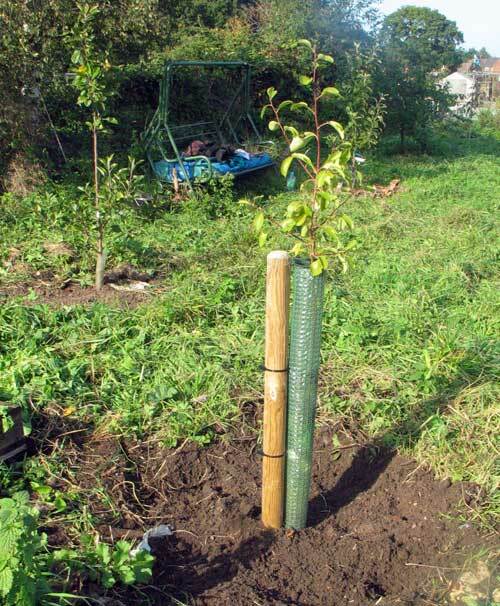 Wash your plums and take off the stalks and any dodgy bits. Weigh them and put them into a large heavy saucepan (cast iron or stainless steel is ideal) while still wet. I don't tend to use my preserving pan which is brass - I find that it tends to leave a slight metallic taste in the jam sometimes. Cast iron, on the other hand, contributes a little valuable iron to the jam! As many people - especially women - are a little short of iron, this is no bad thing. Add about an equal weight of sugar and heat the fruit and sugar slowly, stirring all the time so that the sugar dissolves without getting a chance to burn. Let the plums cook slowly until the fruit is thoroughly broken up. The skins will separate from the mass of the fruit and then the stones will be easy to remove with a fork. You don't have to remove the stones, of course, but this is the easiest moment to do it. Take the pan off the heat while you take out the stones. Now you can boil the plums until setting point is reached. Skim off any scum with a large spoon and keep checking for the setting point. If you want your jam to be pretty perfect, you should take the pan off the heat while you test for setting. This is because you can easily over-cook the jam in a few moments while you test a few drops. Test for setting point by dribbling a little jam mix onto a cold plate. Let it cool down a little - turn and angle the plate to make it run. It should run more slowly as it cools against the plate. Look at the jam carefully and push it with your finger end. It will show a slight wrinkling as you push it if it is ready. When the jam is ready, turn off the heat and carefully pour the jam into heated and sterilised jars. They should not crack with the heat if they have been pre-heated in the oven. If in doubt, place a teaspoon in the jar while you fill it. This transmits some of the heat away from the glass. Use a mug a small jug or a ladle to scoop up the hot liquid, being very careful not to touch it. Cover the filled jars with greaseproof paper rings and cellophane caps, or you can use recycled jam jar lids provided that you sterilise them carefully. You can buy jam covers and labels in the co-op in the UK. You can also make plum jam in the microwave. The directions are pretty much the same - you just have to keep bringing the bowl out to check progress. This can be a hazardous process; use oven gloves and be very careful. Once you become familiar with making jam this way, you don't need to check the jam so often. You can also extract a little liquid jam with a spoon for testing without bringing everything out of the microwave. The bowl used should be glass or ceramic and large enough to easily contain the boiling liquid. It does tend to rise within the bowl dramatically. The cold jam mix should reach no more than about a third of the way up the bowl - otherwise you risk it boiling over. Be very careful about safety when accessing the hot bowl. Hot jam is capable of delivering a nasty burn if it spills on you. Use oven gloves and keep the bowl at arms length if you pull it out of the microwave to inspect it. Keep small children well out of the way, too. Microwave jam is quite easy once you get the hang of it. Preserves made this way tend to keep their colour well and there is no danger of a metallic taste which sometimes can happen with brass preserving pans. You are also less likely to find burnt jam sticking to the bottom of your cooking vessel, so there is less washing up to do - always a good thing, in my book! How much sugar for the best jam? The exact amount of sugar in jam (or coulis) can be increased or reduced to suit different purposes. Use less sugar and be prepared to keep the preserve in the fridge if you want a healthier version. It won't keep as well as full-sugar jam. Plum jam does not seem to need additional pectin. You can also mix in other fruits, for example blackberries. You can use this plum jam as a preserve on scones or bread and you can also use it in pies, puddings and cakes. It should keep for months or even years. A lower sugar jam (really a coulis ) can be made for use as an accompaniment for yoghurt. Peaches and Other Juicy Fruits: From Sweet to Savory, 150 Recipes for Peaches, Plums, Nectarines and Apricots Lots of delicious recipes from award winning author Olwen Woodier. Peaches, Pears & Plums: 40 Recipes for Fine Dining at Home (Flavours Cookbook Series) Some fine recipes from master chefs with sumptuous photography. An ideal book for those who enjoy gourmet foods. The Sugar Plum Fairy Cook Book - Old English Recipes & High Tea This must be why fairies live at the bottom of the garden - so they can make delicious foods from plums and brambles! This is a beautiful and inspiring book for fairies and other folk. Mix a cake mixture (the weight of an egg in sugar, butter and flour, all X 3) in a bowl. I.e. take 3 eggs, 6 ounces of self-raising flour, 6 ounces of sugar and 6 ounces of butter or margarine. Use a food processor to mix, or beat well by hand. Put the plum jam or stewed plums (about 1-2 dessert spoonfuls) into a clean, greased ceramic or glass bowl and add the cake mixture. Cover with cling-film or, to be greener, a glass plate or dish. It's useful to be able to see what is going on! Cook on full power for about 4 - 5 minutes (750 watts). The pudding will rise in the bowl alarmingly, so choose one that is quite deep. This pudding is really easy and kids usually enjoy making it (under supervision) as it is so quick and watching it rise is exciting. Be very careful of the heat when you serve the pudding. The jam is absolutely boiling hot so its best to divide it into portions and let it cool for a minute or two before serving it. You can add anything you like, of course, instead of the stewed fruit. Here's an easy plum recipe which uses up extra bread which is in danger of becoming stale! Grease a pudding basin (2 pint size). Line the basin with some of the bread. Cook the fruit and sugar in a pan with a little water (3 or 4 tablespoonfuls). When the fruit is soft but not pulpy, pour off some of the excess liquid. Fill the pudding basin with the fruit. Add the rest of the bread as a cover. Add the rest of the juice so that the bread is well soaked. Cover the pudding with a saucer plus some weights to compress it a little. Store it overnight in the fridge or a cool place. Serve it with cream, yogurt or fromage frais. Plum wine is quite easy to make and it's great for dealing with a glut of fruit, too. A bottle of plum wine also makes a great gift! Here's a simple fresh plum recipe for wine. 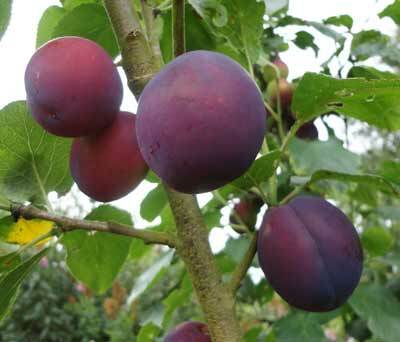 Any plums will work - though Victoria plums are often recommended. You can also use wild plums (bullace), or damsons, or you can add a proportion of other fruit - such as blackberries - if you haven't quite enough plums ready to make a batch. Pectic enzyme is needed because plums are quite high in natural pectin. Chop the plums up roughly and mash them to a pulp with a potato masher or just with your bare hands. Boil 4 pints of water and pour it over the fruit. Leave it for a few hours to cool and draw out the juice. Add the rest of the water (cold). Stir in the pectic enzyme. This will remove most of the cloudiness from the juice. Leave the liquid for about two days then strain off the juice from the skin and stones. Add the sugar to the juice and the wine yeast. A Bordeaux yeast is good but any general purpose wine yeast will be fine. Stir well every few hours until the sugar is well dissolved and the yeast has started to ferment the mixture. Keep the vessel well covered between times. Add the nutrient and stir it in. Once fermentation is well under way, (lots of bubbles and froth rising) put the wine into a demi-john or similar large vessel to ferment. Fit an air lock and put one Campden tablet into the air lock to prevent contamination. You can buy Campden tablets from any home brewing shop. A little sterilising fluid does the same job. Rack the wine when a lot of deposit has formed and fermentation is slowing. All this involves is siphoning off the wine into a clean demi-john. This stops the wine acquiring a taint from the dregs. It's usually a good idea to do it once or twice during the fermentation period. The wine should be ready to drink in about 6 months, though a year or two is better if you can bear to wait!